With over 200 wineries to choose from in both North and South Carolina, there are plenty of options available for either a quick day trip or a weekend get away, so what are you waiting for? Plan your visit ! The wine industry in the Carolina’s is tried and true, this is not a new fad still “working out the kinks”. The industry has been around for quite sometime; steadily growing and improving over the years into award winning wines, vineyards, and wineries. Today these places are beautiful destinations for either the casual visitor looking for a last minute wine tasting or someone searching for that beautiful venue for a special event like a wedding or corporate retreat. Let the Van in Black do the Driving for you on Your Winery Tour! We provide safe and reliable transportation for everyone in your group for any number of wineries you want to visit. All of our winery tours are completely custom and flexible to meet the needs of you and your group. We service most of the North Carolina wine regions including the Yadkin Valley, Tryon Foothills, and the Appalachian High Country. If the winery is in the mountains or Piedmont area of North or South Carolina, we’ve got you covered, we service that area. If you don’t know which specific wineries you want to visit we can suggest some too! 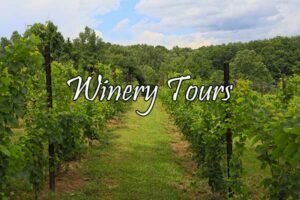 We regularly update our blog on the various wineries and wine trails that we visit, so be sure to check in often to hear about the harvest and happenings in the wineries of the Carolinas! All that is left is for you to choose your wineries and then contact us for an unforgettable trip. Need help finding a winery to visit or coming up with that perfect wine trail? We are more than happy to help make some suggestions. You can also visit the North Carolina Wine website at www.NCWine.org. It is an excellent resource for learning more about the great wines and wineries in North Carolina.